The 10 poster series out today for John Wick 3: Parabellum gives us our first good look at Jason Mantzoukas and Saïd Taghmaoui. The movie franchise of John Wick has certainly focused on the brutal, over the top killings of the aforementioned invincible hero, but this newest foray seems to be an ensemble affair. The marketing for John Wick 3: Parabellum would point to that anyway. You may have seen some Parabellum teasers to the full second trailer that will be released Thursday March 21st, now we have some more visuals to feast our eyes on with the release of these 10 posters from the sequel. Unlike the multiple teasers that we have seen all over the internet, the posters that were released today have two characters that were not spotlighted in any of the released footage. The two characters that came out in the newly released posters are Jason Mantzoukas as Tick Tock Man, and Saïd Taghmaoui as The Elder. We get to see them on their own one-sheets alongside Wick newcomers Halle Berry as Sofia, Angelica Huston as The Director, Asia Kate Dillon as the Adjudicator and Mark Dacascos as Zero. We also see in the 10 posters, Keanu Reeves of course as John Wick alongside his faithful friend, as well as Ian McShane as Winston, Lance Reddick as Charon and Laurence Fishburne as The Bowery King. Chapter 2 ended with John Wick out on the run and excommunicado. This next adventure has John racing against time as a $14 million bounty is placed on his head. The theme of the clock ticking on Wick can be seen in the slogan on the posters: "Tick tock, Mr. Wick". The huge ensemble cast will include enemies and allies alike. 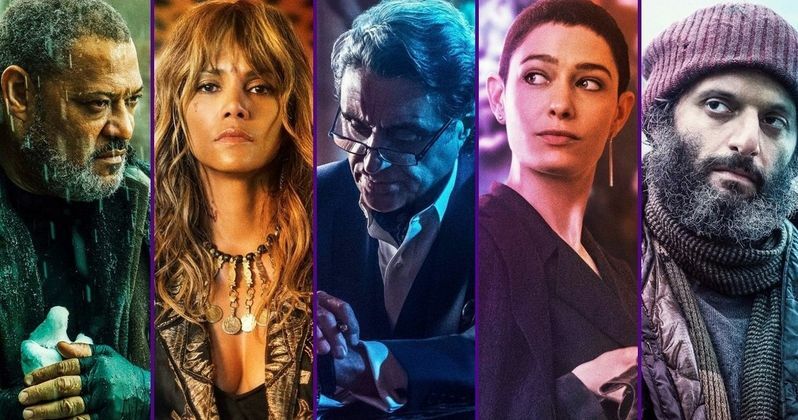 It looks like Halle Berry's Sofia and Angelica Huston's Director may be friends, but as with any John Wick film there will be plenty of enemies to slay like Dacasco's Zero, and Mantzoukas' Tick Tock Man. This latest installment of the John Wick franchise is directed by Chad Stahelski, the co-director for the original John Wick and Reeves' longtime stunt coordinator. Despite working on movies chock full of stunts, Keanu has made it very clear in the past that he does not do any of the stunts in any of the movies he has made. "I haven't done any stunt work... I don't do any stunts. If I'm doing it, it's not a stunt. Stunt men do stunts." This may seem odd to the casual observer, especially if you have seen the awesome youtube video of Keanu Reeves training for the making of John Wick 2, where he runs around shooting multiple guns at multiple targets in a more than impressive fashion. Technically, running around, shooting off prop guns, flipping other actors around, do not qualify as stunts, however the training it takes to complete the awesome scenes in the John Wick movies is more than impressive showing Keanu's true dedication to the John Wick character. John Wick 3: Parabellum hits theaters in Australia on May 16 and in the US and UK on May 17. The posters first appeared on IGN.